Don Draper has always prided himself on running the show, even when his baser drives have been the instruments steering his car. 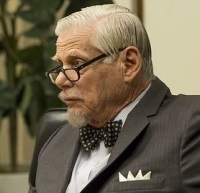 So the final moments of last night’s episode of “Mad Men,” as SC&P’s partners deliver to Don the terms of employment he must accept to be re-absorbed into the fold of his agency, are real levelers to Don’s ego. Even Joan – Joan! – laid it on thick and heavy, as though she were scapegoating Don for all the male injustices she’s had to endure for her entire work life. But, if the conference-room scene seemed broadly like something out of a legal procedural show, the array of men’s pocket squares spoke volumes about the judgment that we saw unfolding, akin to the precise creasing and folds of the fabrics that poked out of the powerful jury-members’ pockets. Going back to ancient times, when the nobility would not leave home without scented handkerchiefs to ward of the smells of daily life, pocket squares have become a recognizable part of the modern male’s fashion repertoire. And in last night’s court session, costume designer Janie Bryant and her team wanted to make a point. Despite its surface ornamentation – which is essentially what pocket squares became – Madison Avenue doings often stank. After all, ads themselves were often no more than perfumed come-ons to consumers to buy foul and harmful products, such as cigarettes. So how did these archetypal “Mad Men” pocket squares identify themselves? The one donned by Bert was crown-like in its prongs, befitting a guy who’s on top of the pile thanks to seniority and experience. His fabric’s got sharp points that say he’s not to be messed with, despite his age. Roger, who slyly made the move to usher Don back into the tribe, has become SC&P’s aging yet experimenting flower child, and his paisley-like pocket square – puffy like aromatic and hallucinatory bong fruits – befits his increasingly Neptunian outlook. What’s notable is that the foundation color of Roger’s square blends with his suit. Essentially Roger is part of the agency scene but his head and psyche are elsewhere. A contrasting color within the square is all he feels is necessary to mark him as part of the tribe. Don displays a pocket square whose edges are barely evident, a telling indicator that he’s spent his post-identity-theft years keeping every thing but the tip of the iceberg buried deep in the recesses of his heart or, in this case, even more fabric. Are you giving anything away about your true nature and motivations based on your choice of pocket squares? Here are some astrological suggestions. Aries: Rams like a passionate, heartfelt leadership statement. Align your square with your blood pump. Taurus: For sensuous and tactile Bulls, opt for only the most touch-friendly fabrics. Gemini: Two tips showing to honor the Twins, please. Cancer: Think security and sustenance: large enough to catch the drips of an ice cream cone or a child’s tears. Leo: Lots of fabric prongs for a Lion’s beloved crown. Also good advice for faux Lions who aspire. Virgo: The square barely elevated past the pocket. Keep it humble. Libra: Scales like it balanced. Consider an elegant pin on the opposite side of the pocket. In a pinch, a name tag will do. Scorpio: Make it well-defined eye-catching prongs for your associates to see. You never know when you’ll need a weapon, if only a symbolic one. Sagittarius: Keep it light-hearted to honor the joviality of your ruling planet. Note to travel-hungry Centaurs: pick fabrics from far-off and exotic lands. Capricorn: Minimalist CEO standard. Less is more. You control the pocket square. It doesn’t control you. Aquarius: We’re all equal, even though my pocket’s sprouting a square and yours isn’t. Stash extras in your briefcase to match your corporate or hipster settings to not offend. Pisces: Artistic and diaphanous enough to use as a rhythmic dance prop. No contrasting colors necessary: Fish love to merge with their environment.